Because you’re never too old to come out and play. Too old for the ball pit but not done playing ball? No problem! 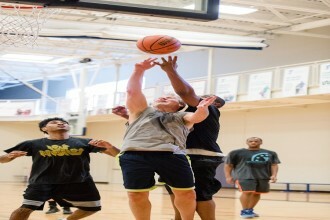 For sports fans 18 years and older who enjoy the fun and friendly YMCA atmosphere but still want to go for the gold, the Adult Sports program provides an outlet for all your competitive energy. Meet new people, stay in shape and sharpen your skills with flag football, basketball, and advanced climbing classes and our belay certification course.